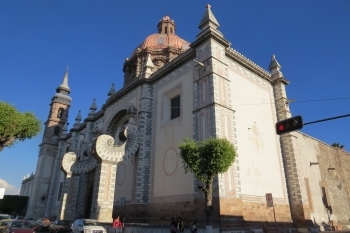 The Historic Monuments Zone of Querétaro is a well preserved Spanish colonial town with its specific 17th century street plan and a number of 18th century rich post-Baroque monuments. The layout of the town was split in two: a rectilinear street plan for the Spanish settlers, and small winding streets for the quarters of the indigenous population. The most prominent feature of the city is its enormous aqueduct, consisting of seventy five arches, each twenty meters wide with a total extension of 1,280 meters and an average height of twenty three meters. It was built by the Marquis Juan Antonio de la Urrutia y Arana between 1726 and 1738. Queretaro I found the least interesting one among the Spanish-colonial cities of Central Mexico. It seems quite an affluent city though, probably nice enough to live in. I understand that it has quite a lot of people from Mexico City move there for better living circumstances. If you're driving around Central Mexico hunting for WHS, Queretaro is a convenient stop and I spent one night here. Did my sightseeing in the afternoon - it took me two hours to find my way around the several tree lined plazas and look at some churches. The nicest is the Santa Rosa de Viterbo: it has really weird, curved buttresses (see large photo above). As we're working right now on a Top 50 Missing list on the Forum of this website (for sites that mysteriously haven't made it into the WH list yet), we could also introduce a Top 50 Removals: sites that have made it in when noone from an AB or the WHC seems to have been looking. Queretaro surely would get my vote for that list. We only had a quick stop for lunch on New Year's Day 2015. As such there were a large amount of families out celebrating their day off. It leant the centre a really friendly and welcoming atmosphere but also meant the city's churches were closed. As with other reviewers here the highlight was the weird church of Santa Rosa de Viterbo which seemed to show a quirky indigenous take on traditional European baroque architecture. A stop in a cafe and a reviving empanada helped fuel us as we strolled around the pleasant squares dotted throughout the centre. It provided a welcome break on our trip up the Camino Real and I think it would be a pleasant place to spend a bit more time. The waterduct with the colection of urban funtains give the city an especial atmosphere. 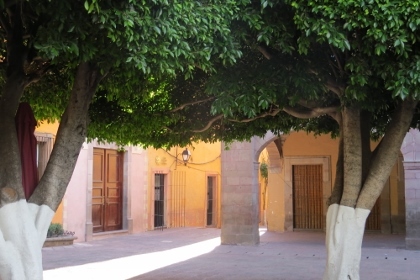 Queretaro undoubtedly has a pleasant city centre. Its calmness belies its situation at the heart of a growing conurbation of over 1 million people. That said, in terms of suitability for UNESCO inscription, I regard it as the “weakest” of the inscribed provincial historical cities in Central Mexico which we have seen. And (whilst not being the ultimate arbiter on such matters!) 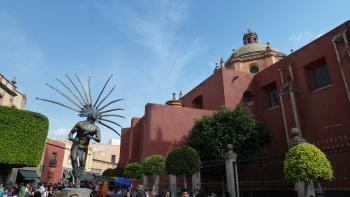 Michelin only grants it 2*, (together with Zacatecas and Morelia) compared with 3* for Guanajuato, Puebla and Oaxaca. 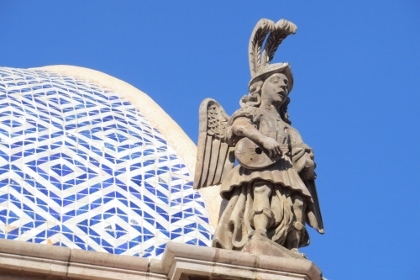 The “edge” which Queretaro claims over other Colonial “Centros historicos” lies (Quoting from the ICOMOS evaluation) in its being a “remarkably hybrid town”. We are told that “some commentators talk of a harmonious way of life or cohabitation between the 2 cultures”. Apparently 2 distinct layouts can be seen in the city’s plan – 20 blocks on the Spanish side of rectangular grid and 30 blocks on the indigenous side with curved and irregular streets! This, we are told, foreshadowed “the bicultural Mexico of today and the emergence of a new form of coexistence in the New World” Hmmmm? I am afraid I regard this as a lot of politically correct wishful thinking! I can see the slight differences in street layout on the map but, as we walked around, the distinction certainly didn’t herald any great change in atmosphere. In any case would it justify inscription even if it did? The centre possesses a number of attractive buildings but Michelin identifies only 3 structures as justifying 2*. a. The St Rose of Viterbo church. This is indeed an impressive structure from inside and out. It is situated a few blocks away to the SW of the main historic area and should be visited – its massive flying buttresses are particularly striking. c. Its most famous structure - The Aqueduct. (photo 2). This was built around 1726 at over 1 km long. It isn’t absolutely clear whether it is included in the definition of the “city centre” but I guess it must be. It now sits in the middle of a busy 4 lane highway and is clearly heavily restored but still manages to impress as a fine piece of civil engineering. 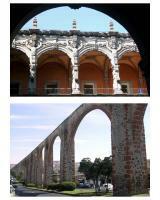 The problem of water impacted a number of the new cities in Mexico - Morelia and Zacatecas each has its own Aqueduct remains but none is as “complete” as Queretaro’s. There are a number of other interesting buildings. We rather liked the “Casa de la Marquesa” – a lovely mansion in Moorish style now a Boutique hotel” But, generally, apart from the Aqueduct, the city buildings are relatively “low key”. a. “In Latin America, there is relative abundance of references to the Spanish colonial period, while some of the indigenous cultures are still not represented”. I suspect that Latin American colonial towns might find it a bit harder in future to gain inscription and that Queretaro did well to get in when it did! Jesuits: Reales Colegios de San Ignacio y San Francisco Javier were both founded by the Jesuits. Sacred Mountains: Sangremal and which was called Ynlotepeque and considered sacred in pre-Hispanic times. 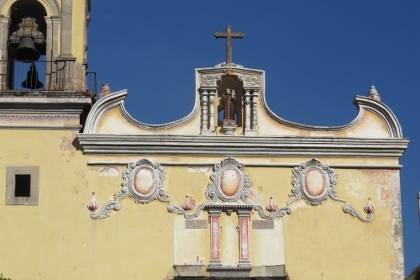 Built in the 17th century: "It is also endowed with a wealth of outstanding buildings, notably from the 17th and 18th centuries" and "It is the buildings erected du ring the economie heyday of the town in the last quarter of the 17th century which gave Querétaro its present-day appearance"